Here's the thing about narwhals. They're kind of amazing, but people don't always buy into their magic. One such person was Christopher - a narwhal non-believer, he was. Despite my many efforts to prove their existence, I was shot down time and time again. Clips of narwhals from YouTube were all digitally altered according to him, and my argument which included the narwhal from the movie Elf, you know, where he says in the deepest most magical narwhal-like voice "Goodbye Buddy, I hope you find your Dad!" He wasn't buying it. I happen to work across the hall from a toy store. Working as much as I do, I get to see all the fun new things they get in, and honestly, I can get a little giddy sometimes. The giddiest I've been, though, was when I laid my eyes on Mr. Narwhal in all of his large, pudgy wonderfulness about six months ago. I kept mentioning to Christopher that there was this narwhal across the hall, but just like that, they'd be gone. They were selling out of narwhals left and right. From time to time, I'd ask the owner if they got any in, but they couldn't keep them in the shop long enough for me to break down and buy one. 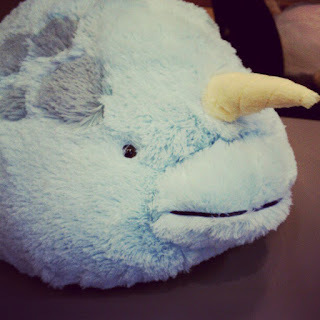 "Fluffy narwhal!! Christmas present, please?" And he said "haha, is that from across the hall?" And I was all like "Yeah!! It's going to be gone today, just watch!" And sure enough, not even ten minutes later, Jan came back across the hall and told me that a mother had come in and bought it, saying her son had been talking about it for weeks and weeks. What a lucky duck, I thought. I immediately called Chris and told him of this news and said we should probably go out to dinner because I was upset, and needed to eat my feelings. He obliged, that good man. and there was Mr.Narwhal. Apparently, Christopher had called over to the toy store right after I had sent him that text and bought it. And I cried. And laughed. And cried a little more. Well I must say, Jan and all HER large, pudgy wonderfulness was delighted to help out with this surprise! 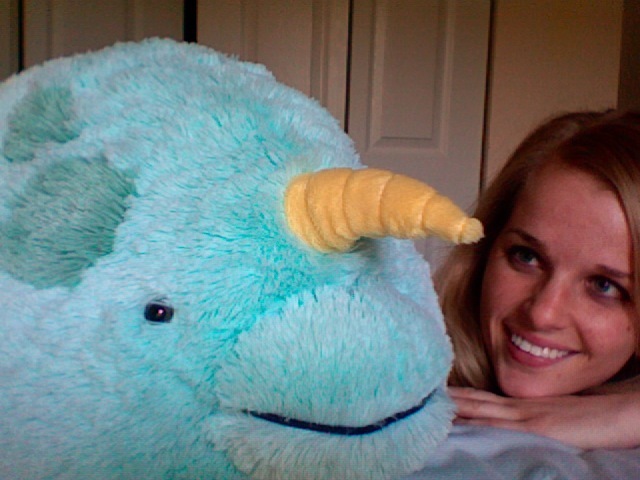 There's nuttin' more gratifying than placing a forlorn narwhal into a loving, stable home! Love,love,love this tale. Oh Christopher you won big points with this one! What a guy!! Narwhals are the coolest. A friend of mine is doing a series of sleeping animal drawings for J's room, and I had requested that a narwhal be one of them. They are magical!